In case the radio thing isn’t your bag, here are my takeaways from Thomas Sowell’s latest (and perhaps most important) book – Intellectuals and Society. Most is paraphrasing what I took to be important points from the book, but some of my own interpretations are mixed in, as well. 1. Intellectuals are defined by Sowell as people who make their living off ideas. So this would be someone like a historian or sociologist, not a brain surgeon or engineer. This is key because the circumstances associated with being supported monetarily by the production of abstractions lead directly to many of the problems that are discussed in this book. 2. Intellectuals generally have very little likelihood of achieving mass acclaim by succeeding at their chosen area of expertise. For example, it is unlikely that a historian who is an expert on the Civil War will ever be famous for that expertise. Yes, he or she may be well-known among Civil War buffs, but that’s about it. 3. There are normally no external criteria for determining the success or failure of an intellectual’s ideas. Whereas an engineer who builds a bridge has objective external evidence of success or failure – the bridge stands safely for an extended period of time – intellectuals need nothing more than the approval of other intellectuals to succeed. For example, one intellectual is granted tenure by a group of other intellectuals. 5. To assuage this emotionally unsettled feeling, many intellectuals venture thoughts and opinions in areas for which they have no expertise. For example, Naom Chomsky, the esteemed linguist, fancies himself a political affairs and history expert, so he holds forth ad nauseum about politics and foreign policy. Truthfully, he has no more expertise in these topics than the typical above-average college-educated person. 6. The reason an intellectual ventures beyond his or her expertise is due to perceived status. (Again, my interpretation.) That is, many, if not most, intellectuals think themselves cognitively superior to the masses – mainly because they have been treated as such for most of their lives. They “get it,” while the rest of us do not. 7. When intellectuals venture beyond their expertise, they almost always do so in an iconoclastic way. In other words, they say the opposite of what most people believe. (Yet again, I’m extending Sowell’s thesis based upon my own observations in the context of the Enlightened Caveman concept.) This only makes sense because an intellectual holding forth about something everyone already believes would have little, if any chance, of getting mass attention. 8. Mass attention, by the way, is always available to intellectuals who stray beyond their expertise to alert the masses of how wrong they are about this and that. This is because of what Sowell calls The Intelligencia – “…individuals would include those teachers, journalists, social activists, political aides, judges’ clerks, and others who base their beliefs or actions on the ideas of intellectuals.” The Intelligencia loves intellectuals because, by peddling their ideas, the halo of superiority of rubs off on them. They, too, can think themselves cognitively more advanced than the average rural dolt, since they can both recognize “the truth” when they see it and they have the job of delivering that truth as far and wide as possible. This, incidentally, stokes their status engines, which is why the distribution of nonsense is so pervasive. 10. Sowell distinguishes between what he calls special knowledge and mundane knowledge. Special knowledge is what intellectuals have – it is very narrow in scope, but deep and comprehensive in understanding. Mundane knowledge, however, is very wide in scope and often is very simple. Intellectuals naturally think of special knowledge (which they alone have) as far more important than mundane knowledge, which is distributed haphazardly among the masses. In other words, knowing about the mating habits of the Kalahari in Africa is much more important than knowing how to frame a house. 11. This disregard for the critical importance of mundane knowledge in the day to day affairs of most people leads intellectuals to conclude that their special knowledge (confined as it may be to a particular area of expertise) gives them the right, nay, obligation to direct the social and economic affairs of society. 12. Intellectuals, therefore, frequently weigh in on matters for which they have very little knowledge, no stake, and no consequences for being wrong. For example, rent control. Intellectuals assert that rent should be affordable to poor people, so rent prices should be controlled. However, they know nothing about the role of the price of rent in conveying the realities of real estate scarcity in a particular area. They have no stake in the property they seek to control – that is, they lose nothing by not being able to charge enough for rent to cover the mortgage. And there are no consequences if the objective – providing affordable rent to poor people – is not achieved. 13. In fact, success for an intellectual pursuing a policy is the enactment of that policy, not the results of the policy. Intellectuals do not go back to see if the policy and/or program they advocated actually led to what they wanted to happen. And if the results of those policies turn out to be the opposite of what they asserted, they will either attack the person bringing the results as biased with an axe to grind, or they will suggest that the policy was not executed properly. In no case will they admit that either the vision – affordable housing for all poor people – was flawed (i.e. not possible) or the means by which they chose to achieve it – rent control – was intractable. Again, there are no consequences for being wrong when you’re an intellectual. 15. In summary, in conjunction with a willing Intelligencia, intellectuals are ruining our Republic at a breakneck pace. No doubt, they occasionally help push us forward when the grip on the status quo has long since been unnecessary (i.e. legalizing gay marriage). However, on the whole, the damage they do far outweighs the good. 16. To counter this, we need only return to reliance on the principles of logic in our public discourse. Obviously, we need intellectuals in society, but we need them to stick to what they know, and we need a society that knows when they venture too far afield. For example, if a person offers an assertion, he or she must be willing to be met with a counter-assertion and must be willing to defend the first assertion on logical grounds, if possible. When this does not happen – because the critic is attacked or there are no logical grounds – we must reject immediately the original assertion. Next, we must cease conferring credibility on experts in one field when they hold forth in another for which they have no expertise at all. And when the media is a party to this intellectual shell game, we need only change the channel or stop reading. I think that’s a little more organized version of what I took away from Sowell’s book. (More organized than the hour-long radio rant.) As I said, it’s an important book, and nothing would please me more than the general recognition of the doom that is being brought upon our society by these alphabet soup children who know nothing of reality and who are clamoring to be important at any cost. These video clips are from the Humanists of Georgia monthly meeting, which happened last weekend (4/19/09). The talk is called “Artifacts of the Caveman Mind.” This is yet another experiment in communicating the enlightened caveman concept. What do you think? I spoke at an Atlanta Freethought Society meeting a while ago. Finally got the video online. Check it out. It’s a good background on how I arrived at The Enlightened Caveman concept. One of the most important changes in my world view has come in the last few months as I’ve digested a lot of the writings of Ken Wilber. Now, keep in mind, that I am very much a “pick and choose” kind of guy, so I have yet to find a personality/thinker with whom I wholeheartedly agree on all topics. Wilber is no different. Nevertheless, his efforts at Integrating disparate and seemingly unrelated bodies of knowledge (and experience) are nothing short of brilliant. And best of all, what he has come up with – a true feat of integral thinking – is amazingly useful when it comes to analyzing and communicating about most anything, including the enlightened caveman concept. Moving on…The core of Wilber’s Integral framework is the notion of quadrants. I internalize this as perspectives – there are four that you can (and should) take when viewing a serious topic. (Non-serious topics do not require such rigor, and failing to recognize this usually results in missing forests for trees.) Anyhow, here’s a look at the four quadrants, lifted shamelessly from Wilber’s Wikipedia entry. Similarly, the lower left (LL) quadrant focuses on the subjective side of things for a collective of individual entities – this is the culture view. The lower right (LR) deals with the external collective – the social side of things. For example, consider the difference between say a chess club and a religious sect. In LR terms, they’re pretty similar – a free-formed gathering of people. But in LL terms, they’re vastly different. One is a group of people who share a common interest – pretty tame as far as culture is concerned. The other, however, has much more going on from a shared subjective experience perspective. Another way to look at the quadrants is in terms of I, We, It, and Its. 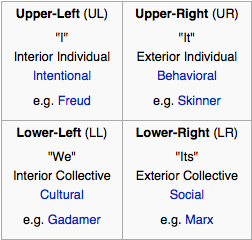 The “I” is represented in the UL quadrant, and the “We” is LL. The “It” and “Its” are UR and LR, respectively. Or, if you prefer Plato, you can think of the UL as the beautiful (as in “beauty is in the eye of the beholder”), LL is the good (as in, morality is a “we” thing), and the right quadrants (UR and LR) are the true (as in, the objective truths of our world). Right away, you can probably see how useful this quadrant thing can be. It provides an additional bit of context for whatever we happen to be interested in. And when it comes to the enlightened caveman concept, it gives me a serious leg up. In the most simplistic terms, my book is a method of improving one’s UL experiences by understanding more of the UR and LR reality of the human species. It is about improving the experience of “I” by really understanding the “it” of myself. It’s similar to how wild-life experts, such as Jeff Corwin, have to learn a great deal of objective information about animal behavior – as in, what kinds of circumstances cause what kinds of responses – in order to successfully navigate their trips into the bush. For us, we have to learn objective information about how our brains are organized, what kinds of capabilities they have, how our emotions work, and when they come into play. Most importantly, we have to learn how much of the “out-of-the-box” human mind can be changed (read: improved), and we have to learn how to change it. When we absorb all this, we can discern how to better navigate the modern world we live in – in interior subjective terms.